It is ultimately the severity of Kyphosis cases that determine their course of treatment. Pain relievers can be used to treat mild discomfort; and for older people, osteoporosis drugs can add strength to the bones. Other noninvasive Kyphosis treatments include physical therapy, exercise, a healthy diet and calcium intake. The use of braces might be recommended for pediatric Kyphosis patients, particularly as they grow. Spine surgery is reserved as a last resort and is recommended only for instances of extreme abnormal kyphosis. If the back rounding worsens, causes pain and reaching the middle or lower back, or brings about additional discomfort after noninvasive procedures have been exhausted, then Kyphosis surgery might be considered. 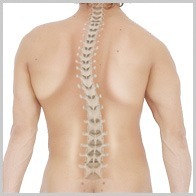 Advanced Kyphosis can produce severe compression of the spinal cord or nerves. The goal of the Kyphosis surgery is to both ease and alleviate pain and to return the spine to a healthier, more natural position. Typically, spinal implants such as rods are inserted alongside the spine to remedy the deformity and lend stability to the spine while it fuses into it’s new and enhanced position. As a result of surgery, most patients report pain relief and overall satisfaction with the procedure. If surgery is needed for this condition, the most common advised procedure is spine fusion surgery; a procedure that reduces the curvature of the spine. The Kyphosis procedure involves the fusion of two or more affected vertebrae together, resulting in the appearance of a much healthier and more comfortable spine. Following surgery, the spine heals beneath the support of rods and screws. If you have noted an unusual curvature in your or your child’s spine, and are feeling some of the same pain symptoms described here, schedule a consultation appointment with Dr. Payam Moazzaz so he can work with you to determine a proper course of treatment. A diagram of the human spine reveals that two regions of the body curve inward: the neck region and the lower or lumbar region. When these regions begin to lose their inward curve, then we find the origins of kyphosis. The spine is the backbone of the body, which safeguards the spinal cord and serves as a literal nerve center for the anatomy–affecting the functioning of even the chest and abdomen. Therefore, a condition like kyphosis can affect any and all parts of the body. Dr. Payam Moazzaz – New Era Spine will work with the patient to diagnose, treat and resolve any instance of kyphosis. Drawing upon a decade’s worth of experience, he will explore both surgical and noninvasive options to correct this all too common orthopedic issue.